The six-level state of the art teaching and research building has some stand out architectural characteristics. 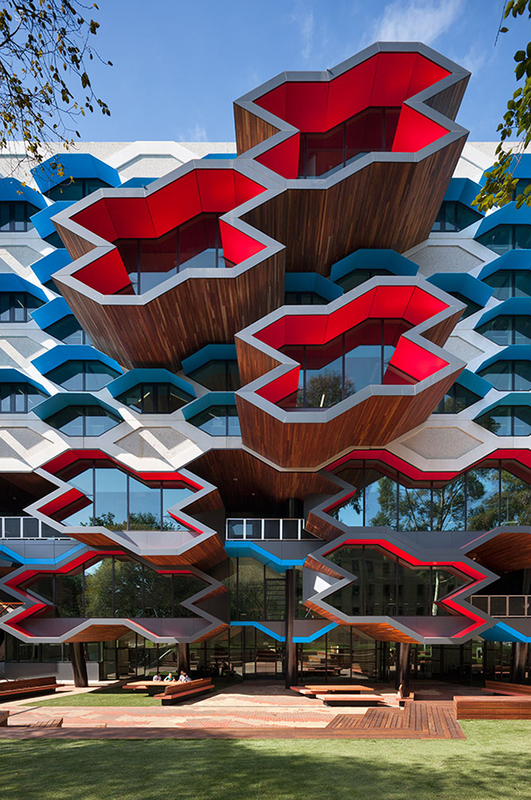 Lyons created an undulating honeycomb-like facade on the rectangular building, where colorful angular components frame the windows. Towards the center of the building three of these components are outfitted with wood, and shoot out from the building to create an eye-catching effect. Lyons welcomed massive structural columns into the design by covering them with bright colors, then angling the columns to create huge X's throughout the building, reminiscent of a jungle gym. Inside, researchers are able to conduct work in spaces full of a medley of vibrant colors, with an overflowing amount of natural light that filters in from the over-sized custom windows - making those long hours in the lab more do-able.